The south-west? We shall exit ‘er in Exeter..
Well, now the dust has settled and I’ve grabbed a few hours of kip in my own bed it brings us to the Exeter leg of the tour. Having surfaced and written yesterday’s blog I got the call from Dan on loading times from the venue, so I checked out and staggered that way to find John and Scott had pretty much got everything out of The Hub and we just had to wait for the bus (or ‘the buzz’ if you’re John) to load up. 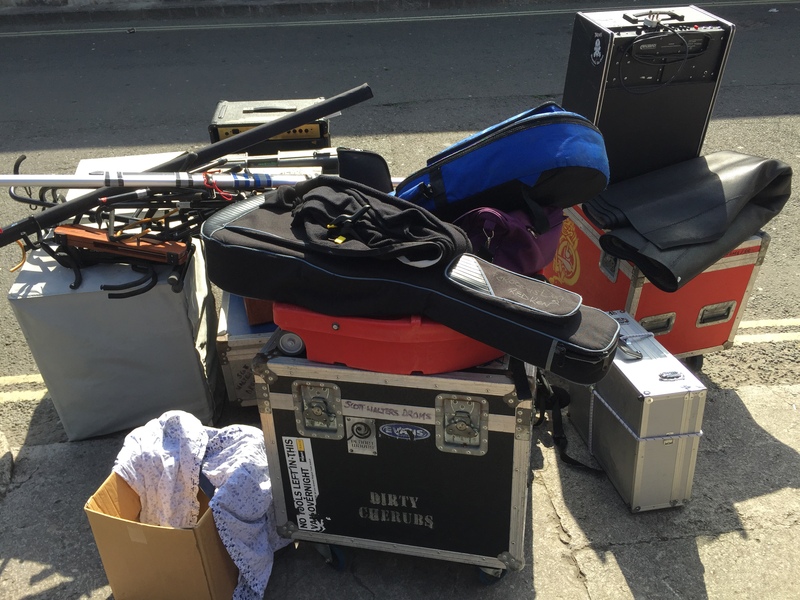 It’s worth considering at this point how much stuff it takes to make a Ferocious Dog gig. Just some of it is pictured below. 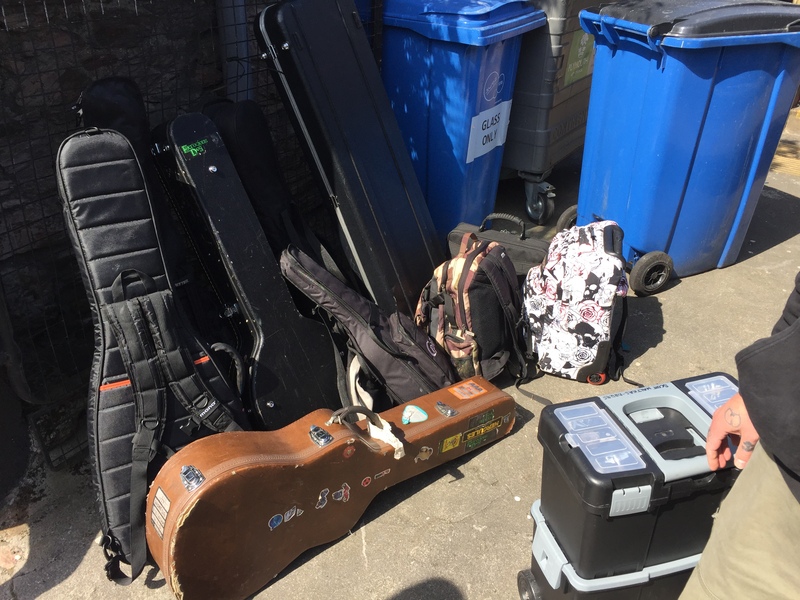 It’s fairly obvious really – there’s six of ’em, Ellis plays about eight million instruments, there’s a drum kit – there’s amps, there’s merchandise, there’s the stage backdrop and assorted maintenance kit, there’s a few spare guitars for quick changes in case of string snappage. Then of course there’s up to ten people in the bus too along with their travelling gear (in our case we only had six of us for most of our journeying). It’s a logistical challenge for sure – and Waggy and Ken are masters of the game of 3D Tetris involved in getting everything in the back section of the dog bus. When you see a band playing to a group of people going crazy, people eulogising about them on Facebook (not least me) and clamouring to get photos or just talk after gigs it’s easy to forget after that it’s the same people – admittedly with some help from venue staff or folk they might have on tour with them – who will be packing everything up and getting it either in the bus or ready to collect in the morning. 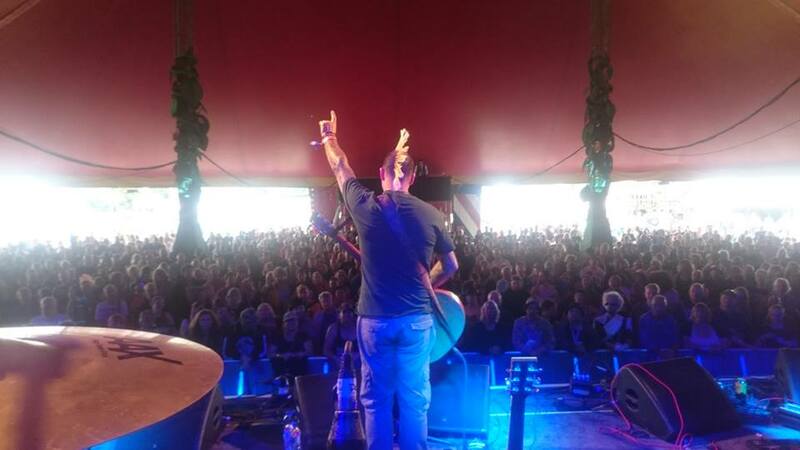 It makes Ken’s mingling with the crowd after gigs all the more charming – and it’s not an act either, he turns heads and starts conversations wherever he goes! Ply-mouth to mouth.. resuscitation required.. The morning after the night before wasn’t too bad in Bridport – a relatively early rise, a return to the venue to meet Ken and Waggy to load up the van then a return to my hotel for and awesome breakfast before reconvening to prepare for our onward journey. Scott and John were ready but it was a little more challenging to get Ellis upright. The locals passing by as the van was loaded were all really friendly – a few had been to the gig, others drawn by Ken’s unusual appearance in the area. It gave rise to some conspiracy theories on the bus that it was all a front for some kind of Hot Fuzz style hidden sinister society underpinning the place, everything just seemed so lovely and welcoming – I’m not sure that’s really true, but it made for some amusing bus banter. The going was good before the roads became terrifying! The run from Bridport to Plymouth is relatively straight forward so was done and dusted reasonably quickly. With John added to team crossword we did a bit better on this trip. As we didn’t have a cigarette stop it’s true that Ellis did start to get a little bit agitated – the signal for this I’ve discovered is when he starts to quote from Robocop! It does make for an entertaining end of journey though, although judging by the look on John’s face maybe it’s novelty factor from my point of view! It’s only one more sleep ’til the tour recommences in Cambridge – and as if to heighten the excitement Ken shared a video that’s surfaced from the Nuneaton gig. I forgot to mention the exciting prospect of a film crew recording the gig. The best bit is that it says ‘sample’ in the title – implying to my ever optimistic mind that there might be more to follow! Either way, I can’t think of much better preparation for this weekend’s mosh-fest than reliving a past one! Keep an eye on howling mad productions‘ YouTube channel and see if any more videos surface! For now, here’s ‘Poor, Angry and Young‘ (which Roger amusingly pointed out on Facebook has a similar intro to ‘Rock Lobster‘ by the B52s – which once you realise can’t be unheard! Sorry about that.